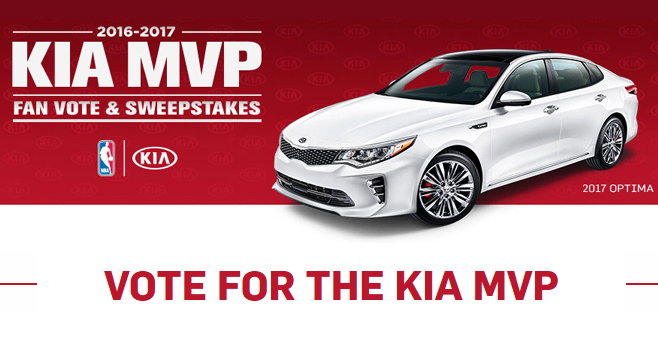 The KIA MVP Fan Vote & Sweepstakes 2017 is here. It’s time for all NBA fans to vote for this year’s 2016-17 Kia NBA MVP at NBA.com/KIAMVPFanVote. Each vote will count as a chance to win a copy of NBA 2K17 or the grand prize of a trip the NBA Finals 2017 including a meet and greet with an NBA Legend. The Grand Prize Winner and a guest will be sent on a 3-day, 2-night trip where they will have to opportunity to attend a game of the NBA Final 2017. The grand prize package includes round trip coach class airfare for 2, hotel accommodations, a pair of tickets to the game and a meet and greet with an NBA Legend. A prize valued at $3,000. Online: Participants must visit NBA.com/kiamvpfanvote to cast their vote. Participants must choose their Top 5 Players then hit the “Vote Now” button. Via Google.com: Participants can search for keywords Kia MVP or a player’s name and “Kia MVP” on Google.com then select a team displayed on screen to begin voting. Via Twitter: Tweet the full name or player handle of your favorite NBA Player nominee with the hashtags #KiaMVP and #Sweepstakes. After you completed any of these voting methods, you will be invited to register for the Sweepstakes for a chance to win a trip for 2 to the NBA Finals 2017. Kia Motors MVP Sweepstakes 2017 is open only to individuals who are legal residents and physically located in one of the 50 United States or the District of Columbia, and who are 18 years of age or older at the time of entry. Sweepstakes begins at 12:00:01 PM Eastern Time on April 1, 2017 and ends at 11:59:59PM ET on April 14, 2017. Limit one Entry/Submission per person/email address/social account, regardless of submission method, per day. Potential winners will be selected in a random drawing on or about April 17, 2017 from among all eligible entries received. Total ARV of all prizes is $3,500. Sponsored by NBA Properties, Inc., 645 Fifth Avenue, New York, NY 10022 and Kia Motors America, Inc., 111 Peters Canyon Rd., Irvine, CA 92606. Administrated by teamDigital Promotions, Inc., 6 Berkshire Blvd., Bethel, CT 06801. For the winners’ names (available after 5/22/17), visit winners.teamdigital.com/KiaMotorsMVP. For complete details, see Official Rules.